My friend Jo is deathly afraid of goats. She hates them. Their beady eyes with rectanguloid pupils, their nubby head nubs and tiny woman beards, what's not to mistrust, really? Yet because of this, I have begun to find goats hilarious. If their is one thing above all else that men will never tire of, it is teasing girls. How great is it to just be able to hold up a thing, even a picture of that thing, and reduce a person to cold sweats and convulsions. It's like having the ability to trigger someone's diabetes at the drop of a hat. Fighting by a farm? Toss her in the goat field. Losing an argument? Bleat a plaintive, "MaAaAaAaAaaaaa…" and end the discussion with the force of a stray bullet. That said, I now know a man who lives in an upstairs apartment above a survivalist landlord. This man keeps goats, which I am becoming more and more desperate to pet and be photographed with, if only for more Anti-Jo cruise missiles. I'm failing pretty hard, though. However, I have a new prospect. The same man who lives at the bottom of my father's street and collects giant metal roosters (wow, lot of internal links today), apparently keeps a ram. There is no point to this. As far as I can tell he owns know other goats, wild or otherwise. 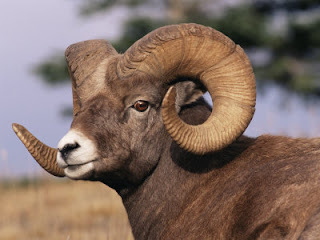 This is a male, with big, curvy horns I could blow shofar music out of; it will not produce milk. If not for breeding, milking or straight-up eating, I don't know why this ram is kept so well. Perhaps the man is simply fattening him up for the end of the year, I really don't know. What I do know is that every time I drive to my dad's place, now, I find myself slowing down around this one turn and straining to see if I can find that blur of white among the treeline. Well this past Wednesday I did see it, and unlike the last time, its owner was nowhere to be seen. Straight-legged, the ram was perched atop a large, round bolder as rams are wont to do, chewing some hay with a circular motion of his mouth. As I neared a gap in the rock wall surrounding the property, I screamed out, "Hey, goat!" The ram stopped and looked directly at me, or as directly at anything as a creature with panoramic vision can look at anything, twisting his head and freezing mid-cud. I wasn't sure what to do. I had the animal's attention. It was aware of itself. It knew what it was! Oh, sure, you say he merely turned to observe the sudden noise, but I know better! He thought I was going to convey some seriously important information to him, and I had to do it. That, or I had to be really, really mean and verbally abusive right away. Obviously, I chose the latter. "You're a goat!" I yelled. Pressed for time and with little else to add, I sped away, cackling as I left. I had nothing to say to that goat, but damned if I didn't say it loudly. And we all know that's what counts in teasing something.